The Mets begin their 50th anniversary season Thursday amid modest expectations befitting a squad with thin starting pitching, shaky defense and Jason Bay in the middle of the lineup, but if everything goes right, they might also be fun to watch too. I’m optimistic of a good start at any rate. 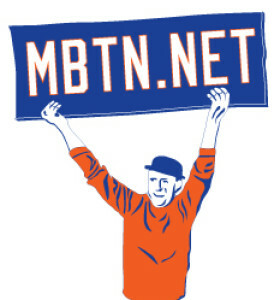 It’s the Mets’ 50th season and MBTN’s 13th. As I’m sure you all know by now, the banged up foursome of Andres Torres, David Wright, Scott Hairston and Tim Byrdak all healed in time to answer the bell and comprise a squad of 25 we probably could have predicted back in December. It’s further encouraging to see Ike Davis and Johan Santana are among them. And so today we welcome the returnees back, and the new ones the best of luck. Officially joining the All-Time Numerical Roster for the first time are players Andres Torres 56, Ronny Cedeno 13, Frank Francisco 48, Ramon Ramirez 52 and Jon Rauch 60; and coaches Bob Geren 7, Ricky Bones 25, Tom Goodwin 26 and batting practice pitcher Eric Langill 78. Returning in new numbers are Mike Nickeas, now wearing 4; Tim Teufel, now coaching and wearing No. 18 and bullpen catcher Dave Racianello, in 79. I’ll be updating the rosters shortly please let me know if you come across any errors. Let’s Go Mets! Anything can happen! Submitted by Dave Mackey (not verified) on Thu, 04/05/2012 – 9:58am. Santana is not on your 2012 roster? That’s odd especially since he’s your starting pitcher today. Here’s to a great 2012 season! Submitted by max (not verified) on Thu, 04/05/2012 – 3:02pm. Torres hurt himself again already. Submitted by hodges14 (not verified) on Thu, 04/05/2012 – 10:30pm. Batboys wore bb today. Departure from the norm. Submitted by jrgame (not verified) on Thu, 04/05/2012 – 10:36pm. What number do you think Kirk will wear? Submitted by Jon Springer on Fri, 04/06/2012 – 7:15am. BB for batboys definitely a new thing, I got Kirk in 22 almost certain, and thanks for reminding me to “reactivate” Santana. Been a while!